Most people have some type of routine to start their day. For some, it’s a freshly brewed cup of coffee with the morning paper. For others, it’s fixing lunches for the kids and rushing them off to school before heading out to the “daily grind.” Life can nonetheless become exhausting at times between assignments, schedules and deadlines. What better way to start your day than to make your first appointment with the Lord? As written by author E.M. Bounds, “If God is not first in our thoughts and efforts in the morning, He will be in the last place the remainder of the day.” Such truth and conviction! Sometimes we can pack a schedule so full that we push the Lord right out of it. We can make our plans, but the Lord determines our steps. His purpose will prevail. Psalm 5 shows David coming to the Lord in the morning and receiving the strength and joy he needs to make it through the day against many adversaries. The Psalmist cries out to the Lord with an open heart that he would be heard, bringing his requests before the Lord, and waiting expectantly for Him to answer. David made it a point to pray in the morning because he wanted to honor God and set the tone for an entire day dedicated to Him. David instructs us what to do before and after prayer. Before we pray, we direct our prayer. After we pray, we look up with expectancy to heaven, believing that God will answer. God is a prayer-hearing God. If we pray fervently and in faith, we have reason to hope. May your “daily grind” begin with a fresh cup of Jesus, being filled until your cup runneth over. Oh, taste and see that the Lord is good; blessed is the man who trusts in Him! 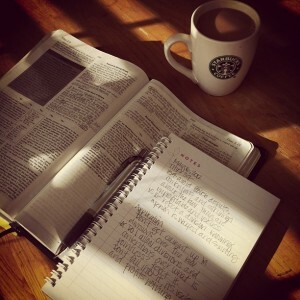 (Psalm 34:8) The best part of waking up is JESUS in your cup!